The Sacred Cat of Burma, or Birman, is an exotic cat, majestic in its demeanor but, at the same time, very friendly and intelligent by nature. Although the breed originated in Burma as the Sacred Temple Cat of the Khmer people, it should not be confused with the Burmese, to which it is quite unrelated. The first appearance of the Birman cat in the western world is their introduction to France in 1919. The transfer from east to west remains shrouded in mystery with little documentation of the cat's actual history until more recent times. The French registries recognized the "Sacre de Birmanie" as a natural breed in 1925. Many of the world's other registering bodies have considered the Birman a French breed ever since. The English version, "Birman" is derived from the French spelling of their name. The breed was recognized for championship competition in England in 1966 and in the United States in 1967. The Birman is a color-pointed cat with long, silky hair that does not mat. Its pure white feet are one of its most striking features, setting it apart from the other breeds commonly confused with it, such as the Himalayan, Balinese, and Siamese. Ideally the Birman should be a large, strongly built cat, with males greatly outweighing the females. Its large, blue, almost round eyes set in a round face with a Roman nose gives it its sweet expression. Birmans come in all point colors, with seals and blues being the most common. The white gloves should go across the front feet in an even line and be symmetrical. On the back feet the gloves also cover the foot and then extend up the back of the hock, ending in a point. These are called laces or gauntlets. The amount of white allowed for showing is very specific. Often too much or too little white is the only the difference between a show cat and a pet. Because of its sweet nature it is easy to handle, quick to learn, and makes an ideal house pet. It has a small voice and characteristic tiger-like walk. Centuries ago, the Khmer people of Asia built the Temple of Lao-Tsun in which to worship a golden goddess with sapphire-blue eyes, Tsun-Kyan-Kse. A much beloved priest, Mun-Ha, often knelt in meditation before the goddess with Sinh, a beautiful white temple cat beside him gazing at the golden figure. One night raiders attacked the temple and Mun-Ha was killed. As he died, Sinh placed his feet upon his fallen master and faced the golden goddess. As he did so, the hairs of his white body turned golden, and his yellow eyes to sapphire-blue, like hers. His four white legs turned earthy brown -- but where his paws rested gently on his dead master, they remained white as a symbol of purity. The next morning, the other ninety-nine white cats of the temple were as golden as Sinh, who did not leave his place after his master's death until seven days later, he too died, carrying with him into Paradise the soul of Mun-Ha, his beloved master. It is said that since that time, whenever a sacred cat died in the Temple of Lao-Tsun, the soul of the priest was said to accompany it on its journey to the hereafter. At this point legend ends, and history begins. The temple was left in peace until at the beginning of this century, it was again raided. Two westerners, August Pavie and Major Gordon Russell, came to the aid of the priests. Later in 1919, as a gesture of gratitude the priests sent to the two men, then living in France, a pair of their sacred cats. Unfortunately, the male did not survive the ocean trip, but the female by then was pregnant, and the survival of the breed in the West was insured. Once more, misfortune struck when during World War II the breed in France was once again reduced to only a single pair. But by the early 1960's the Birman had made their appearance in Britain where Mrs. Elsie Fisher of Praha cattery imported the first. The breed was also introduced in the United States about the same time and has been gaining in popularity ever since. Most Birmans are named using the letter of the alphabet that corresponds with the year they are born. Here is a helpful chart that lists the years and the letter. 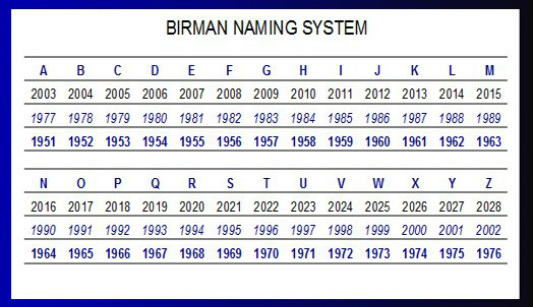 Many of Annbirwaves Birmans also have a "generation" letter designation. It was a tradition that started with the Red and Tortie breeding program. The F1s were named with two words... an A and then the year letter.